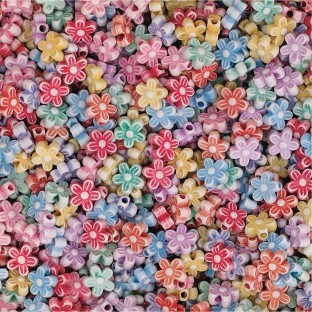 Plastic pastel flower beads in assorted colors. Beads are 8mm with 1.5mm hole. Over 1,000 beads per 1/2-lb bag. 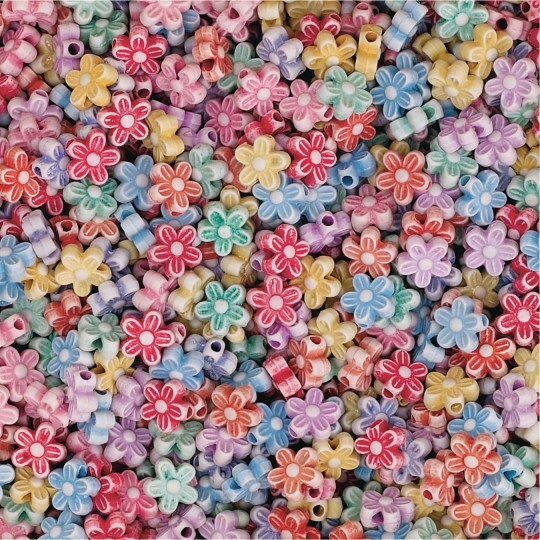 Plastic pastel flower beads in assorted colors. Beads are 8mm with a 1.5mm hole. Over 1,000 beads per 1/2-lb. bag. The residents loved making bracelets for spring with these. They look cute on them now. I only use these for necklaces. They seem too fragile for any other use. There were an awful lot of partial beads plus many unusable because of mangled petals. Some had no holes at all. Merchant response: We appreciate the review and have issued a gift certificate towards a future order. Kids' necklaces bracelets. Fun color bulky storage. These are much prettier than the picture shows. Because of the clay texture not sure how long they last but would recommend this. Good quality.